Home sweet home awaits in Roy’s idyllic countryside! 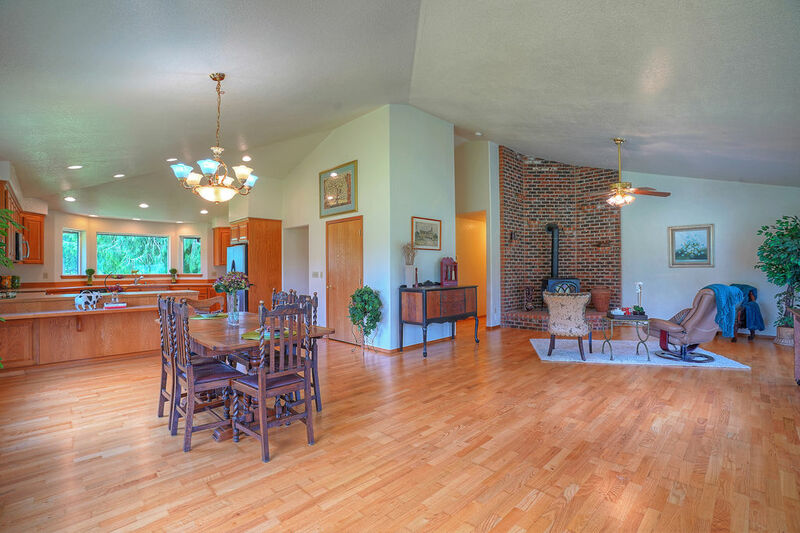 Find plenty of room to spread out in with this spacious 2,344-square-foot custom rambler on 1.25 acres. Built in 2005 and brimming with bright and inviting spaces ideal for entertaining, this 3-bedroom, 2-bath home is also conveniently move-in ready. Plus, you’ll find an incredible outdoor setting that’s blossoming with potential. 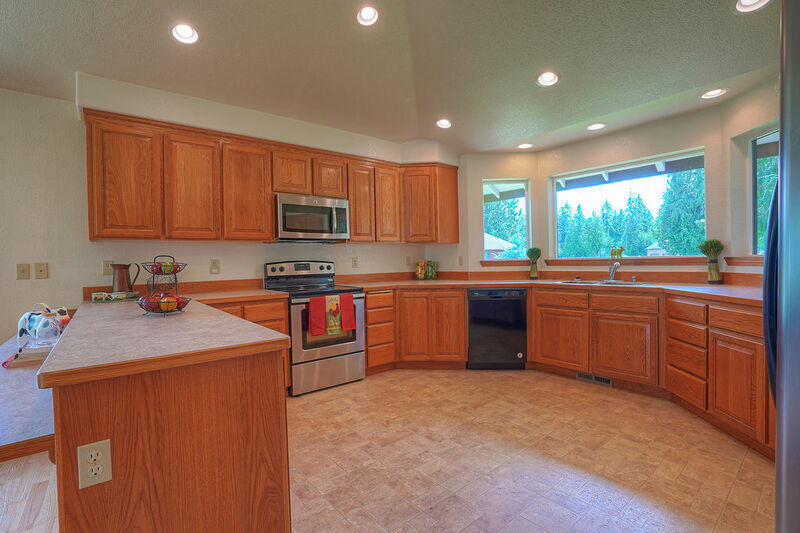 Located at 2301 301st St S Roy WA 98580, this one-of-a-kind rambler is listed for $399,000. Tucked away along a picturesque road, this home provides plenty of privacy and space to call your own while still giving you a sense of community with neighbors close by. An oversized driveway welcomes you home, and the sprawling green lawn coupled with mature trees make for a truly delightful first impression! A charming front deck is perfect for shady afternoons spent relaxing, and right in through the front door, the entryway leads you in to discover this home’s palatial great room! 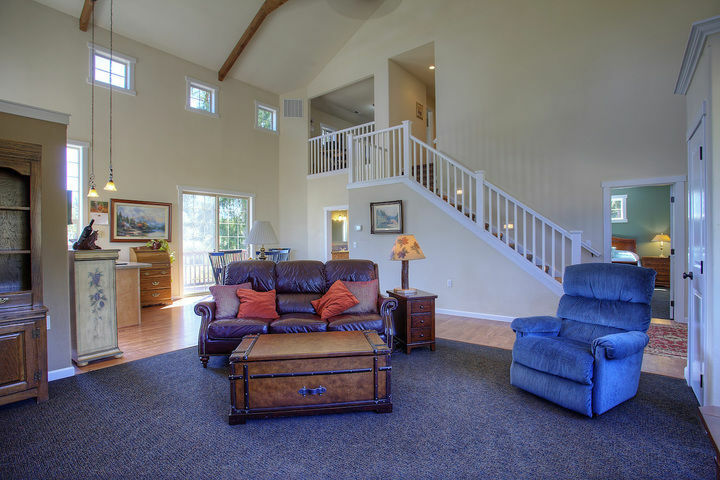 Featuring vaulted ceilings and engineered hardwood floors, the versatile main living area is terrific for entertaining! Gather around the wood burning stove that’s surrounded by gorgeous floor-to-ceiling brick accents, an eye-catching element that just adds to the comfortable country feel of the entire residence. The layout seamlessly flows into the large dining area, and here you’ll find ample room for a full-sized dining table, wonderful for hosting a crowd! Laid-back seating can be found at the kitchen counter, a thoughtfully designed space boasting tons of storage and room to move around in. Store kitchen essentials in generous cabinetry and in the pantry, and find ease in having extra-large counters to spread out on, whether you’re meal prepping for the week or baking up dozens of batches of holiday cookies. In the living room, French doors open up to reveal the largest living space of all—the backyard! 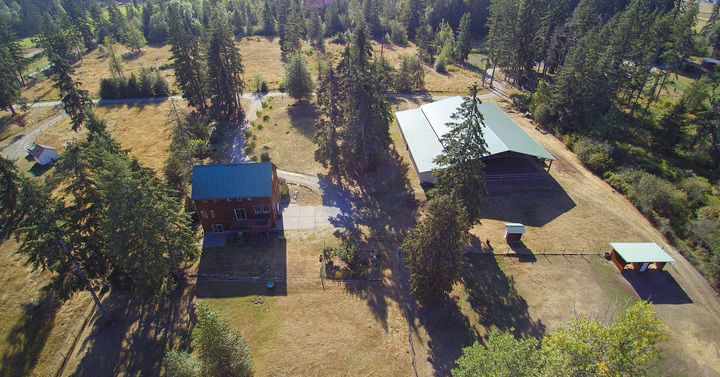 The lush lawn stretches on to tall trees in the distance, and whether you’re tossing around a football, playing fetch with your pup, raising livestock, or cultivating your own garden, you’ll find 1.25 acres worth of possibility here! Take in a view of it all from the huge back deck, and outdoor oasis that’s ready for relaxing on comfy lounge chairs or barbecuing up dinner for a weekend get-together. At the end of each day, this home’s 3 bedrooms provide loved ones with peace and privacy. You especially won’t want to miss the master suite—boasting an extra-large layout, there’s plenty of room for a sitting area. Take advantage of direct deck access, a large walk-in closet, and a luxurious 5-piece ensuite bath as well! 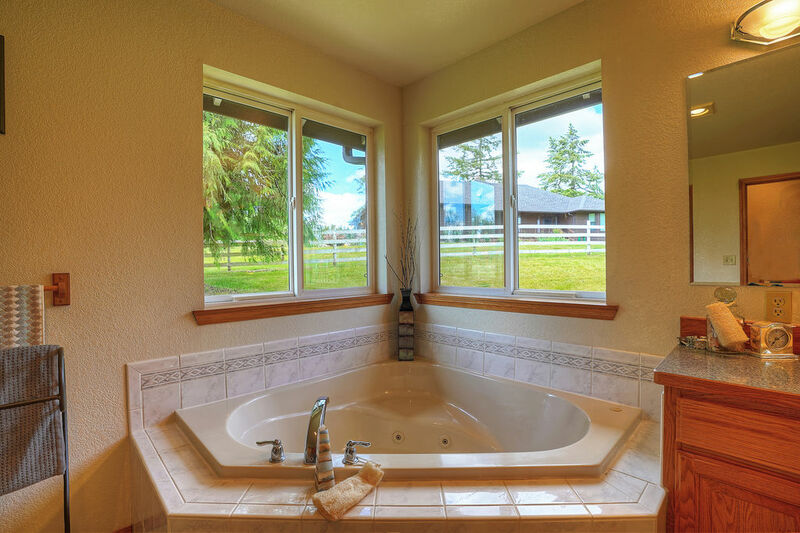 Like the rest of the home, the ensuite bath features a large layout, and includes a corner jetted soaking tub for a spa-like experience right in the comfort of your own home! 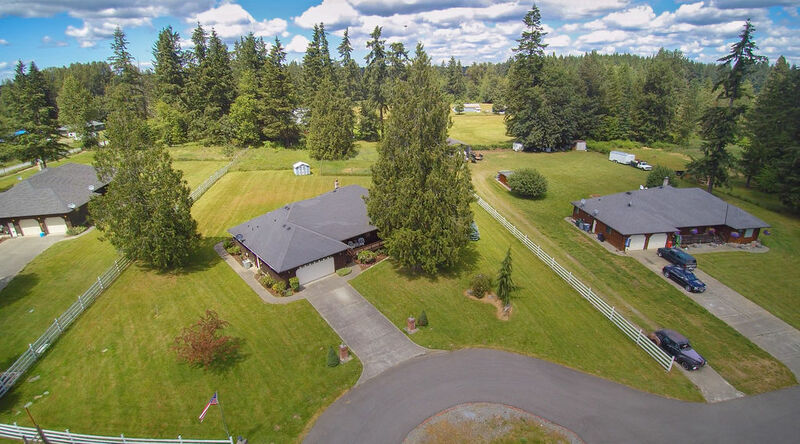 At 2301 301st St S Roy WA 98580, you can take advantage of being in the peaceful countryside while still having easy access to places like Joint Base Lewis-McChord, Tacoma, and Olympia! You’re only an 11-minute drive into the town’s center, where you’ll find schools, the library, eateries, and services. Enjoy having outdoor opportunities at your fingertips—lakes, camping, hiking, fishing, and more are just minutes away! Interested in learning more? Click here to view the full listing! You can also contact REALTOR® Linda Solheim online hereor give her a call/text at (253) 279-7665, or contact REALTOR® Erin Dobrinski online hereor give her a call/text at (253) 380-7702. SOLD ~ Full Price Offer!! 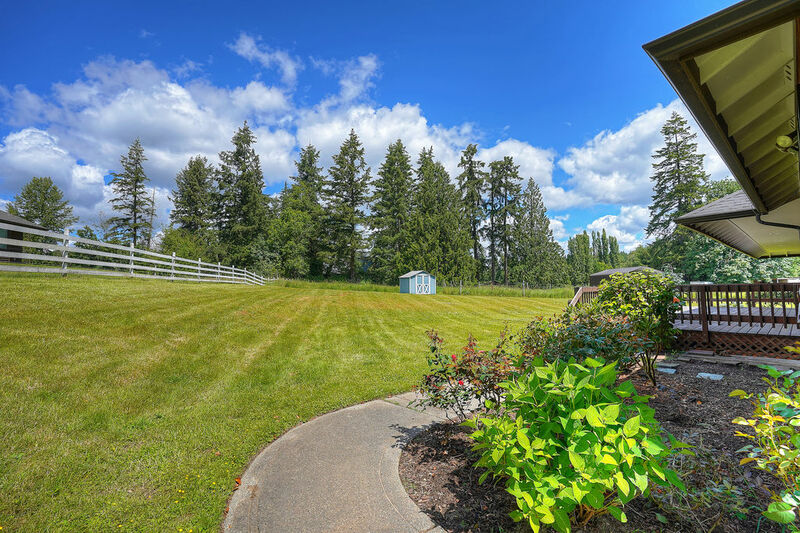 Nestled in Roy’s idyllic Rainier Vista neighborhood, this gated country estate is exceptional in every way! Perfectly sited on an expansive 4.84-acre property, an opportunity like this only comes around once in a lifetime. Featuring a 3,933-square-foot home, a show barn and an additional shop (perfect for using as an event venue or storage! ), an in-ground pool, and so much more, this turn-key treasure shows off resort-worthy amenities and magazine-inspired style at every turn. 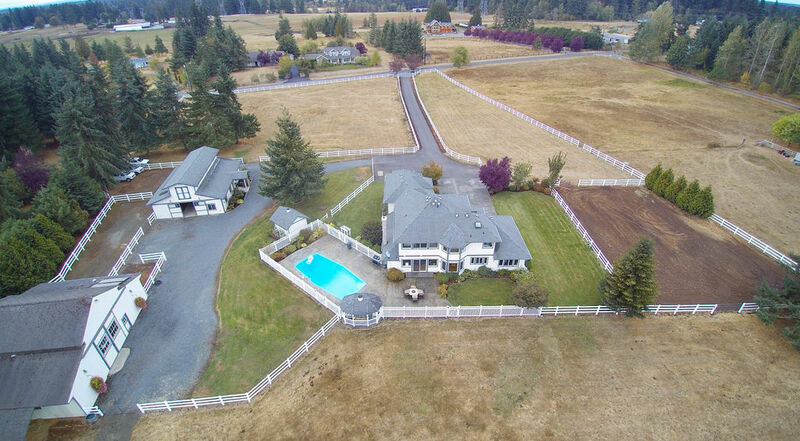 Located at 29817 2nd Ave S Roy WA 98580, this estate is listed for $874,950. Here, you’ll also discover a grand entry with French doors, a wash rack with hot and cold water, a spacious tack room, a feed/supply area, a laundry room with a washer and dryer, a sink and toilet, plus a loft that accommodates up to 20 tons of hay! 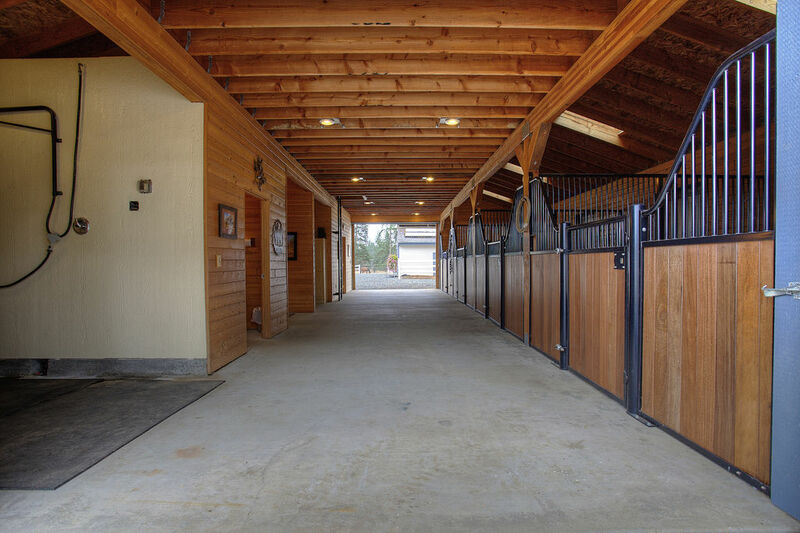 An outdoor arena area is also perfect for horse enthusiasts. Discover even more space in the garage-shop, a versatile masterpiece perfect for storing an RV, horse trailer, your bikes, or your vintage car collection! Fancy starting an event business? Imagine hosting a country-inspired wedding or event here—in fact, this incredible structure has already been home to weddings and more! The rest of the estate is well-suited for hosting events and weddings as well, with its picturesque setting (perfect for photo ops! ), lush lawn, a romantic gazebo, and plenty or room for parking. The in-ground pool and sprawling stamped concrete patio offers even more space for entertaining, whether you’re hosting weekend barbecues or a lively summer pool party! This estate’s stunning 3-bedroom, 3.25-bath luxury home is just as impressive as its captivating outdoor amenities. Brimming with relevant updates that include new doors, millwork, paint, and carpet, this pristine residence is truly a joy to spend time in. A grand entryway welcomes you inside, where tall ceilings and a majestic staircase winds its way upstairs. 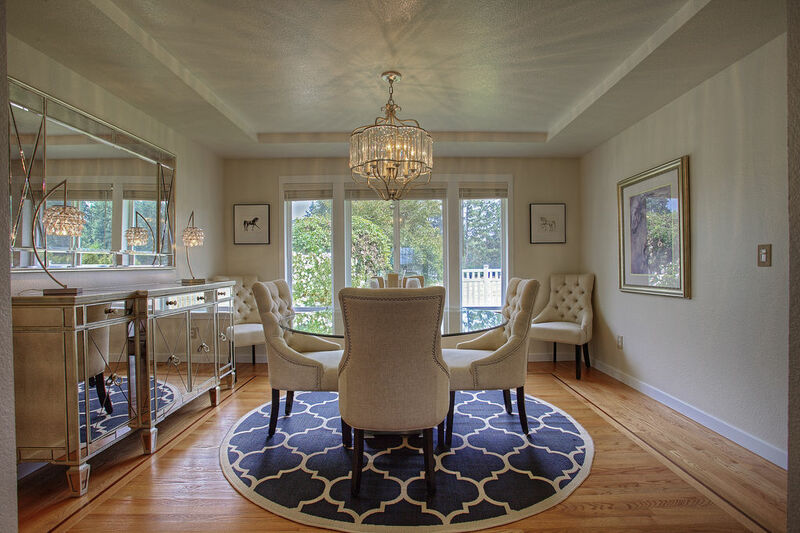 Entertain guests in the formal living room and formal dining room, a lovely setting that boasts shimmering hardwood floors with cherry inlay throughout. Whether you’re having guests over for a dinner party or hosting a crowd for a holiday get-together, this haven of entertaining offers a contemporary palette that’s ready to be infused with your own unique style. Toward the back of the home, a palatial great room promises to become the hub of daily life. In the expertly designed chef’s kitchen, find the best in function and fashion. Jenn-Air appliances and custom cabinetry offer efficiency and storage, while gorgeous granite slab counters ensure there’s ample room for meal prep. Wonderfully light-filled, the kitchen also provides bar-style counter seating, and from there the layout effortlessly flows into the family room, a cozy atmosphere featuring a classic pellet stove. The main floor also includes a versatile den, while upstairs you’ll find a huge bonus room and 3 bedrooms that offer even more flexible space. Each bedroom offers indulgent comfort and privacy, but the master suite is especially not to miss! Double doors open up to reveal this relaxing sanctuary, where you’ll find a large layout, elegant recessed lighting, and sunlight pouring in through large windows. Most noteworthy is the stunning master bath—this rejuvenating oasis is truly the stuff of dreams! 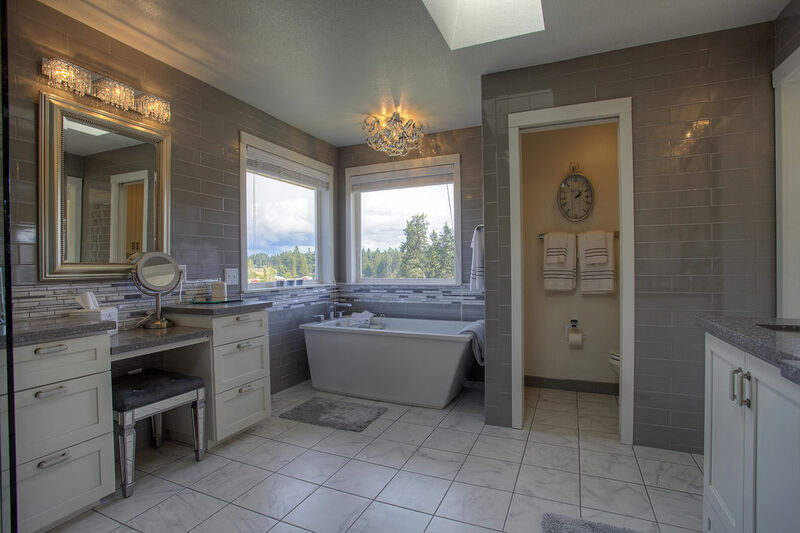 Featuring porcelain floors, a custom double vanity, a dressing table with gorgeous quartz, a grand glass and tile shower, plus a modern, free-standing soaking tub, this spa-ready paradise offers a thoroughly premium experience! A small city in Pierce County, Roy offers residents the opportunity to live on larger properties in a rural atmosphere. 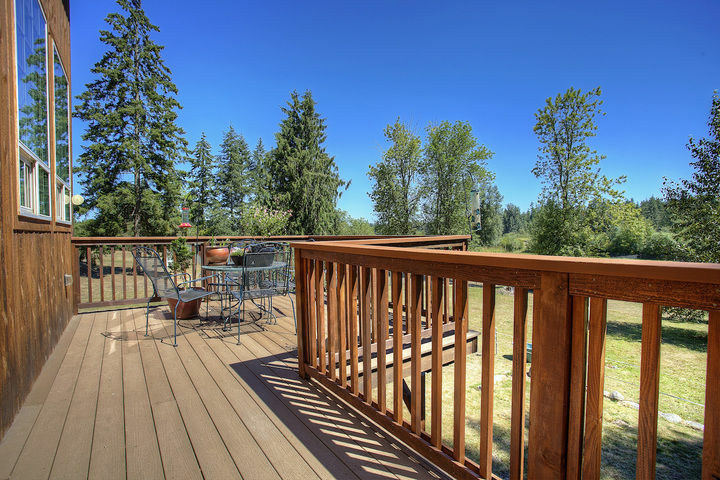 At 29817 2nd Ave S Roy WA 98580, you’re close to amazing outdoor activities, whether you want to spend the day at Northwest Trek, go fishing or boating on one of the nearby lakes, or head to Mt. Rainier for hiking and camping! You’re also close to city amenities, with Downtown Tacoma being just 30 minutes away, and with Puyallup being just a 20-minute drive away. Plus, Yelm and Joint Base Lewis-McChord are also close by. 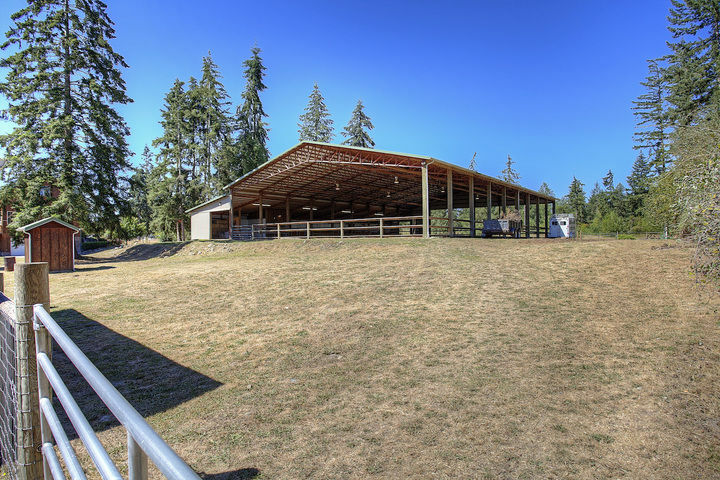 Spread out over an impressive 6.79 gorgeous acres in Roy, Washington, this one-of-a-kind equestrian property is a horse owner’s dream! Featuring a Carriage House-inspired residence, a dynamic 108’ x 72’ Steel Span covered arena and much more, this Roy property has it all! 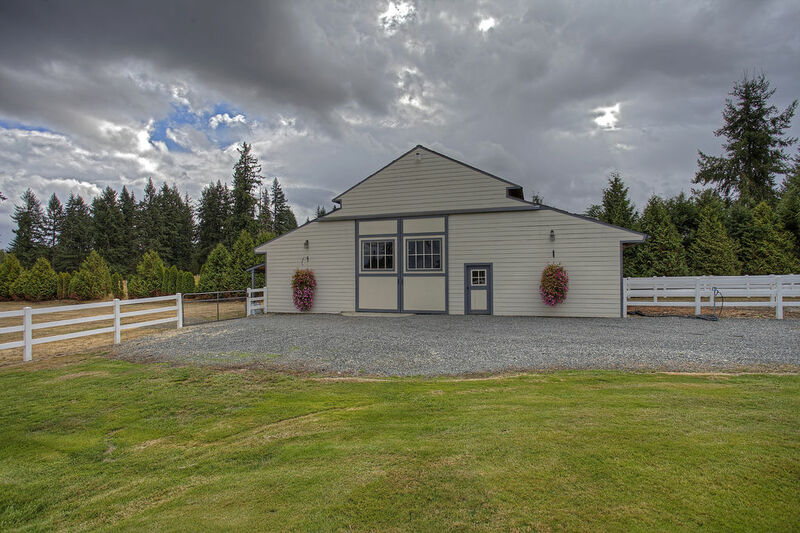 Located at 35821 55th Ave S, Roy, WA 98580, this 2005-built home is listed for $575,000. Brimming with wide open spaces and elegant details, this property’s expansive residence boasts comfort and convenience at every turn. A generous 2,451-square-foot layout includes 1.5 stories, plus a daylight basement and a mother-in-law suite on the lower level. On the main floor, an open-concept layout and new flooring throughout welcome you to relax and entertain in style. Soaring ceilings catch the eye, while several windows bathe the space with the warmth of natural sunlight. 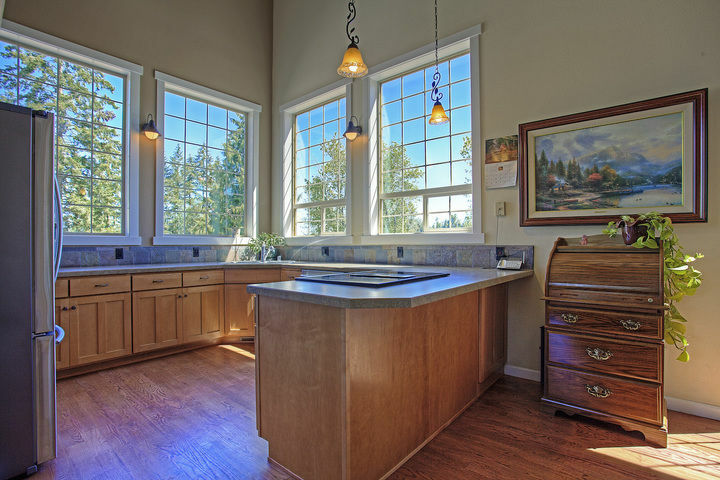 In the kitchen, find even more walls replete with windows, offering scenic views of blue skies and mature emerald trees. 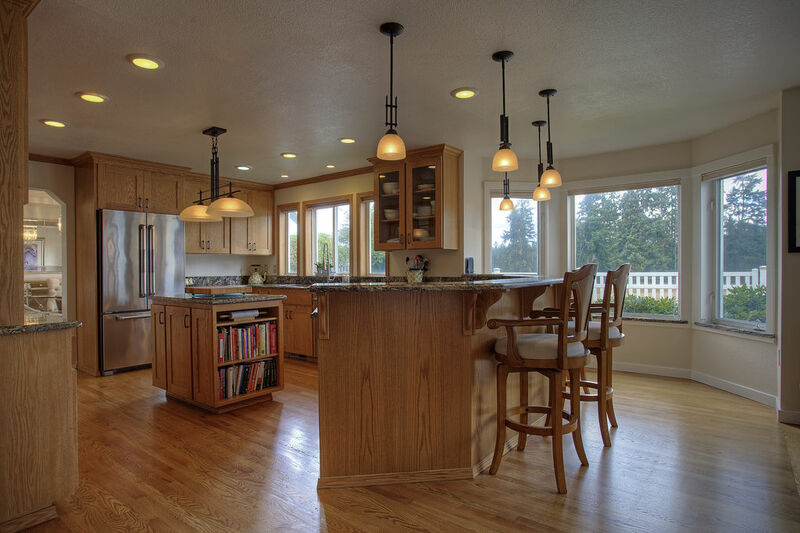 The kitchen boasts stainless steel appliances, as well as generous counter space and cabinet storage for ease and efficiency day in and day out. The main level also boasts a luxurious master suite, complete with a spa-inspired ensuite bath and a lovely walk-in closet. 2 additional bedrooms and a total of 2.75 baths in this home ensure that everyone has their own private space when it’s time to unwind! 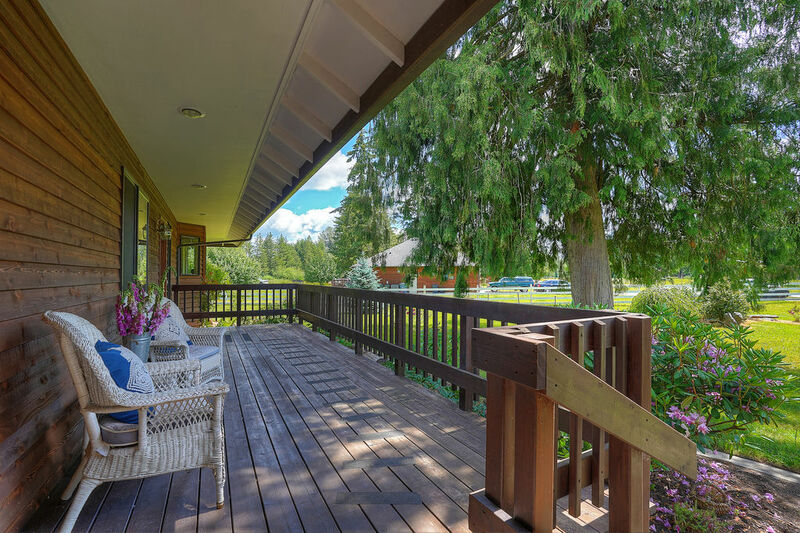 On the main level, sliding glass doors lead from the dining area right out onto a spacious, beautiful deck with tranquil views of lush grass and trees that stretch on into the horizon. When the sun comes out, enjoy your morning cup of coffee or an evening glass of wine in this relaxing haven! Just beyond, an incredible 108’ x 72’ Steel Span covered arena awaits. 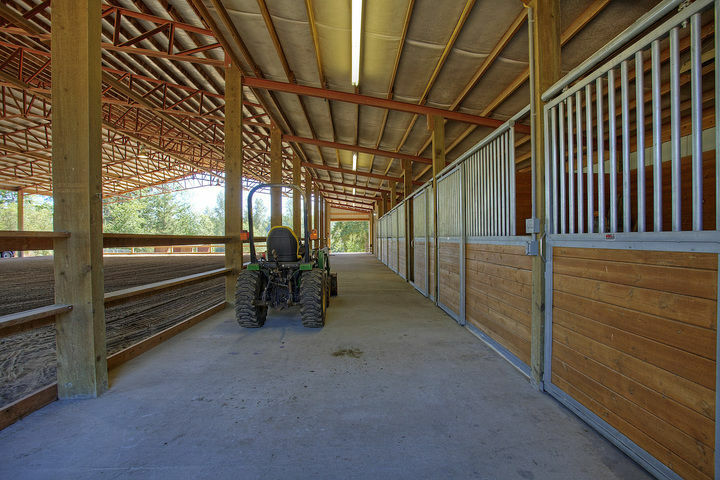 Complete with six 12’ x 12’ matted stalls, a wash rack, tack room, and hay storage, this dynamic space comes with everything you and your horses need, all under one convenient roof. A loafing shed can also be found on this 6.79-acre dream property that awaits your ultimate vision of home to become a reality! Located in southwest Pierce County, Roy is a small city known for its rural setting and picturesque scenery. Those who love the outdoors will especially appreciate the location—opportunities for spending time outside are aplenty! Head out for weekend camping trips, day trips to Mt. Rainier, or spend an afternoon fishing on a nearby lake. For those who need to commute, it’s a quick 6-minute drive to connect to Highway 507, making it easy to head north or south. Joint Base Lewis-McChord is also just a 20-minute drive away, making this locale ideal for those who work on the base.